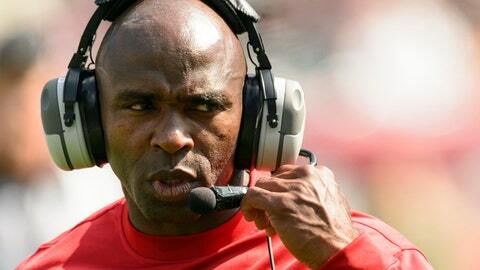 Charlie Strong will be the first black coach in a major men's sport at the University of Texas. Texas officially has its man. Charlie Strong will replace Mack Brown as the Longhorns’ head football coach. "I’m excited and my family is excited to have the chance to lead one of the premier football programs in the country," Strong said in a release. "Texas is one of those places that is always on your radar and a program anyone would dream of being a part of because you have a chance to compete on a national level every year. It’s special because it has such great history, pride, tradition and passion for football." Strong was 37-15 in four seasons as Louisville coach, including a 23-3 record in the last two seasons. His team also won the Sugar Bowl against Florida at the end of the 2012 season. Strong agreed to a five-year, $25 million contract, according to multiple reports. That would make him college football’s third-highest paid coach, behind only Nick Saban and Bret Bielema. Strong informed Louisville athletic director Tom Jurich of his plans to leave on Saturday night. Strong told Jurich money wasn’t an issue and there was no counteroffer. "Texas is a premier, premier job. Let’s call it what it is, not try to hide from it," Jurich told reporters. "Every expectation I had for Charlie at this university he exceeded. Every, single one." The 53-year-old is a native of Batesville, Ark., and served as defensive coordinator on Florida’s staff from 2003-09, winning a pair of national titles. He will be the first black coach in a major men’s sport at Texas. Strong has a reputation as a high-discipline, no-nonsense coach. "To follow a future Hall of Fame coach like Mack Brown, who built a program that had great success and a reputation of doing it with class and integrity, is extra special," Strong said.